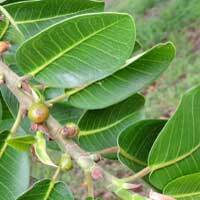 Medium to large tree with big, smooth green leaves and thick heavy limbs. Clusters of 4cm dia. 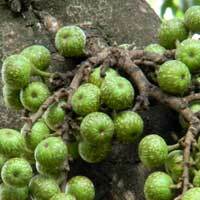 fruit are borne in clusters on short branchlets arising from main branches. Elyptical leaves exude milky sap when torn. Fruit globular on hanging stems. Ovate leaves. Tree large at maturity. A strangler fig that begins as an epiphyte. Bark smooth, gray. Fruits in leaf axils. 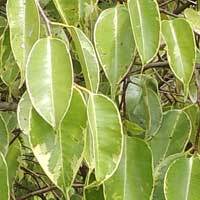 Varieties of this tree, native to India, with variegated white and green leaves are popular in gardens. Aerial roots become additional trunks to support a huge spreading tree. Large, glossy leaves. 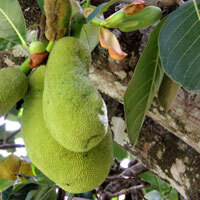 Large tree with big shiny leaves and very large fruits covered with pyramidal bumps. 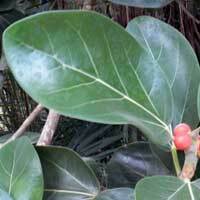 Cultivated in warm, humid areas. 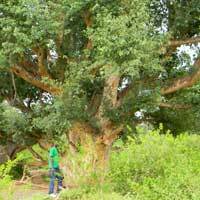 By no means am I an expert on the Natural History of Kenya because I am so new to exploring this part of the World. By creating a page for the species as I learn them I am teaching myself, sharing with others, and happy to receive feedback from web site visitors.